Posted by Dave in Recipes on Sep 11, 2018	. There are certain smells that we associate with warmth and comfort. 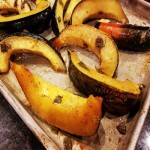 The smells of this squash roasting in your oven exude those emotions with sage, nutmeg, herbs and honey. It’s a perfect side dish for any cool evening. Posted by Dave in Recipes on Aug 15, 2018	. Posted by Dave in Recipes on Jul 31, 2018	. One of the simplest recipes you will make yet so luxurious and extraordinary. Take our word on it, after your first batch you will find the need to double the recipe as it goes quickly. Posted by Dave in Recipes on Jun 14, 2018	. Posted by Dave in Recipes on Jun 10, 2018	. Posted by Dave in Recipes on May 20, 2018	. Stir and pour over ice and garnish with an orange slice. For an extra special treat skip the ice and add a scoop of vanilla bean icecream or orange sherbet. Smiles will be your reward. Posted by Dave in Recipes on May 18, 2018	. Posted by Dave in Recipes on May 11, 2018	. We use just a 1 Tablespoon of our Cincinnati Chili Seasoning to 8 oz. cream cheese then top it with Any of our Balsamic Glazes, Drained Pepper Spreads or Balsamic Jams. Great dip for crackers , veggies, or chips.